Trucking accidents happen for many different reasons. Drivers are too tired to drive. The cargo may not be secured. Many truck companies pressure their drivers to drive too fast. Drivers can be easily distracted. When trucks collide with cars, the cars can be easily crushed. Cars are simply no match for the size, weight and dimensions of trucks. Truck drivers should understand how deadly truck accidents are when cars are involved. Drivers need to understand that trucks are difficult to navigate and take other precautions. One danger that trucks present is that trucks make very wide turns. Drivers should be trained on how to make intersection turns. They should be on the constant look-out for cars that are too close and warn the cars with their horn or lights. Left-hand turns. Drivers often need to try to veer into another lane in order to make this kind of turn. Left-hand turns are especially dangerous because they cross multiple lands of traffic. 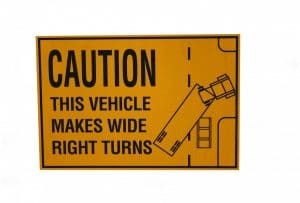 Truck drivers need to make sure they have enough room and enough time to make the left-hand turn. Right-hand turns. Many drivers think they’re safe if they are positioned to the right of a truck – after all, what could be safer than making a right-hand turn? Many states allow right-hand turns while the traffic light is red. Unfortunately, trucks that don’t maneuver to the left as much as possible when turning right can easily pin and crush a vehicle that is to the right of the truck at the intersection. U-turns. U-turns are forbidden at most intersections. Even when traffic laws permit a U-turns, trucks should avoid making a U-turn virtually all the time. It’s better to turn into an open lot or to make multiple single turns than to make a U-turn. Is the truck driver liable for my injuries? While truck drivers should always be on the lookout for nearby cars, cars should steer away from trucks too – especially if a truck is stopped at an intersection. It’s better to wait and let the truck pass than to try to speed by the truck. If you have been injured in a trucking accident that was caused by someone else’s negligence, the Charlotte truck accident lawyers at Warren & Kallianos, PLLC can help you get justice. We have nearly 60 years of combined experience fighting for North Carolina accident victims. We demand compensation from truckers and truck companies who are responsible for your pain and suffering, medical bills, lost wages, and vehicle damage. Schedule your free case consultation by calling 704-275-5593 or completing our contact form.